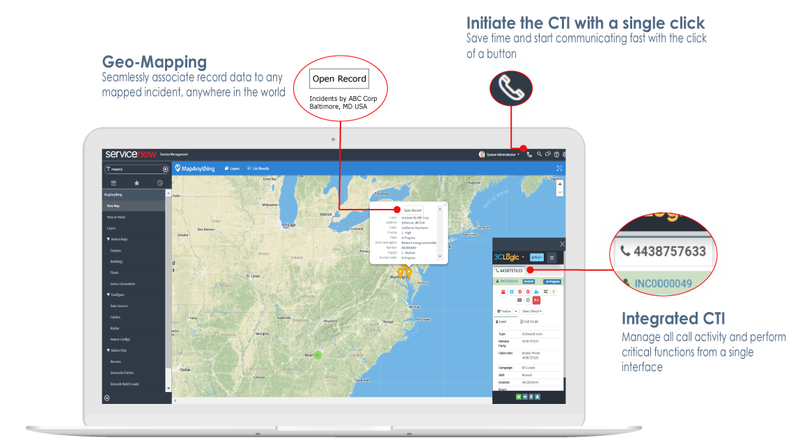 Solve customer needs at lightspeed by combining 3CLogic's Computer Telephony Integration with MapAnything's geo-productivity platform for ServiceNow. Allow agents to visually monitor and map real-time requests while optimizing performance and customer engagements to drive comprehensive customer service and incident resolution. Optimize the performance of your agents with a fully integrated contact center platform and easily enable click-to-call functionality directly from within MapAnything. Eliminate manual activity documentation with automated postings, notes, call recordings and more, directly to the ServiceNow incident or case from MapAnything. Close customer incidents and cases faster by streamlining client engagements and follow-up activities, delivering a superior experience and a satisfied customer. Combine MapAnything's geo-mapping platform with 3CLogic's contact center offering to offer a more visual view of what drives daily activities and agent tasks.